The Models 5005, 5006, 5007 and 5008 Piezoelectric Accelerometers are offered in a choice of sensitivities and mounting configurations for general vibration and shock work. The unique design of the piezoelectric seismic system ensures that the units have no discernible spurious response to mounting torque, body strains, cable vibration, cable whip, pressure variations and most heat transients. The stainless steel housing provides an environmentally rugged unit, while the epoxy seal offers protection against industrial environments. Its grounded case construction provides tight mechanical coupling which yields accurate, wideband shock and vibration data. 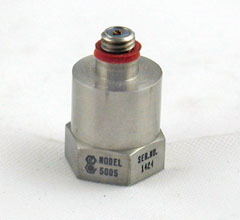 The Models 5005 and 5007 are supplied with a removable mounting stud, and the Models 5006 and 5008 incorporate a fixed stud. Mounting adapters are available for those applications where electrical isolation is required, but this will limit the frequency range to 5KHz. High temperature units will operate in environments up to +500 Deg. F.